LAUSANNE, Switzerland -- The World Baseball Softball Confederation (WBSC) today revealed the Official Game Schedule of the VIII Women's Baseball World Cup® 2018, which for the first time will be staged in the United States at the USSSA Space Coast Complex in Viera, Florida, from 22-31 August. 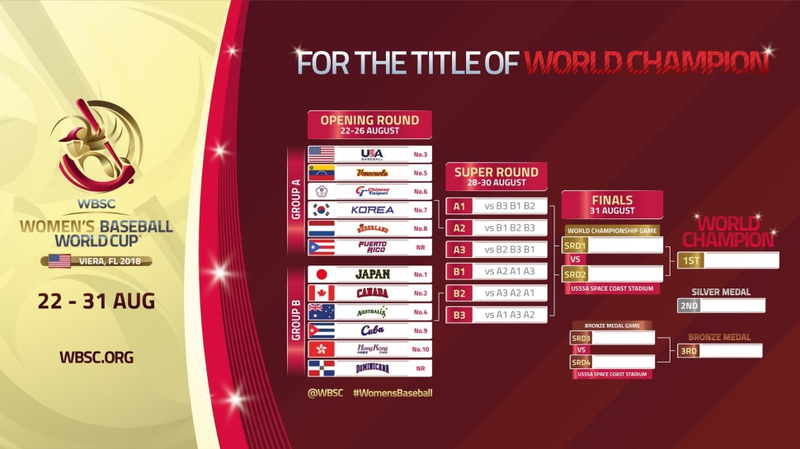 The Women's Baseball World Cup -- baseball's biggest event for women -- will be contested over a record 50 games and in three stages: Opening Round (group stage/round-robin), Super Round and World Championship Medal Round. "WBSC is proud to expand the Women's Baseball World Cup schedule to 50 games, which represents an increase from 44 games in 2016, and more than doubles the amount of games  from the 2014 edition," said WBSC President Riccardo Fraccari. "The top women's baseball players in the world will have their biggest-ever platform to showcase their talents and our sport to audiences worldwide, as they battle for the world title and deliver more exciting National Team and women's baseball content to fans." USSSA Acting CEO Don DeDonatis III said: "USSSA is both excited and honoured to partner with WBSC to provide the biggest competition platform to date for the Women's Baseball World Cup. Having the eyes of the sporting world on USSSA Space Coast while these world-class athletes showcase their abilities over 50 games in 10 days is something that we as an Association are extremely proud to be a part of. We cannot wait until August 22nd." The battle For the Title of World Champion will begin with six games per day in the Opening Round.